During the past few years, new online casinos for usa players are popping like mushrooms after rain. From one side it’s positive since it offers players more exiting options to play online, but from the other side it says something about the current stage of USA online casinos industry. At this point in time, it seems a bit behind in terms of stability, regulation and so forth. We pointed the main advantages and disadvantages of new online casinos in our main article. In order not to repeat ourselves, we will just post a quick summary and then focus only on new online casinos USA. Needless to say, that we will refer only to licensed online casinos. If while browsing the net you happen to bump into non licensed online casino, our recommendation is to stay away. Another year, another new casino for Casino Max guys. With all that’s going on it kind’a makes sense. There is no place for stand alone casinos anymore. If you want to succeed and compete of course. Roaring 21 is the third addition after the successful Casino Max and a bit less successful Cherry Jackpot. 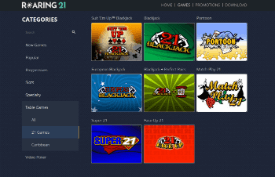 Despite the name, Roaring 21 Casino is definitely not a blackjack focused site and slot players can enjoy it as well. New players can enjoy a total of $4,300 Welcome Bonus package plus 21 free spins. Have fun! Another RTG casino, sister to CasinoMAX. The site was launched in October and it’s focused on USA and Aussie players. 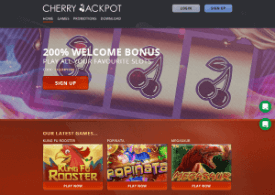 Cherry Jackpot is mainly focused on slot machine fans and offers high welcome bonus package of 200% up to $2,000. This bonus is redeemable 10 times, which means that you can get up to $20,000 in total. Great new RTG casino, launched by the same people that stood behind Lucky Red and Club World casinos. 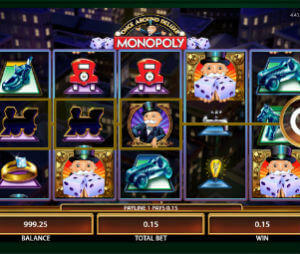 CasinoMAX offers a nice array of games, available on both, desktop and mobile. Slot fans can enjoy their $9,000 welcome bonus package, which consists of 3 bonuses of 300% up to $3,000. Another casino launched by a known and reputable group. Exactly the type of new sites which we like. 24VIP is managed by the guys from Superior Casino. 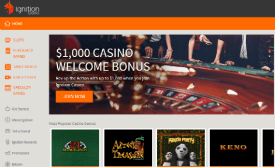 It is powered by Rival Gaming and offers new players $10 No Deposit bonus to try it out. If you like, you can enjoy $1,000 in match bonuses. The news we all bee waiting for – A new casino from the company behind Bovada and Slots LV casinos, the best casino group on the US market. Ignition casino offers games by Rival, RTG and Betsoft, perfect support, 1 day payouts to USA players and more. You can try Ignition with a $1,000 welcome bonus. Another great casino from the group the brought you Slotocash, Miami Club and Uptown Aces. Red Stag is powered by WGS software, formerly known as Vegas Tech, and offers over 150 games, including the unique 7-reel slot machines. If you hurry, you can enjoy their special offer of 275% bonus up to $550 on your first deposit. If you stick around, you will get another 6 bonuses on following 6 deposits, worth $2,500 in total. 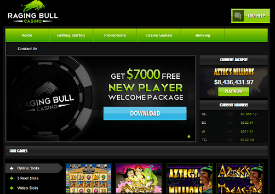 Raging Bull is a new USA online casino launched in January 2015. The casino is powered by RTG software so you have 190 games to choose from and almost 150 slot machines. It is owned and operated by Merus (UK) LTD, company that also operates Grand Fortune and Sunset Slots casinos. Currently, you can make a deposit only with Visa or Mastercard. Withdrawals are done by wire and take 5-10 days to hit your account. 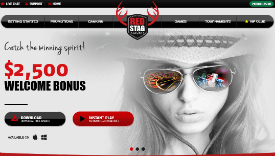 Raging Bull casino offers pretty much endless bonuses to new and existing players. New players can start with $50 free bonus and then 300% bonus up to $750 on your first deposit. After that, you have a variety of promotions for every day of the week. The only downside is that most bonuses have some maximum cashout limit. For example the max cashout on the free bonus is $150. 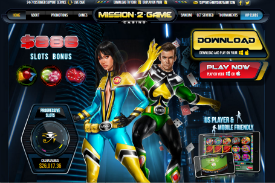 Mission 2 Game is a new online casino for US players, launched in January 15. This is a bit extraordinary site, both in terms of design and the game it offers. Mission 2 Game casino is powered by Soft Magic Dice software (formaly known as Wizard Gaming) and offers over 100 casino games. Uptown Aces is a cool new casino that was launched in August 2014. Uptown Aces is powered by RTG (Real Time Gaming) software and has both download and no download versions and is available on Mobile as well. As we said, Uptown Aces casino is powered by RTG, which means that it offers almost 200 different online slot machines, including the popular Real Video Series Slots such as Cleopatra’s Gold, Jackpot Piñatas, Achilles and more. Unfortunately, at this point the do not have 3D Slots, but the variety that Uptown Aces offers for sure compensates for that. The casino accepts players worldwide, including US. The only exceptions are: New York, Kentucky, Washington State, Maryland, New Jersey, Louisiana and Missouri. 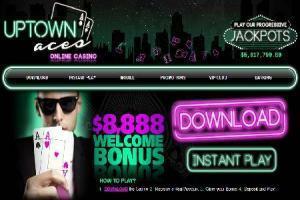 In our opinion Uptown Aces casino has the potential to become one of the top new online casinos USA in 2014. 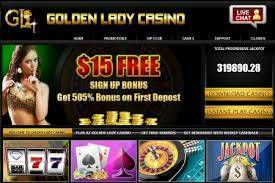 Golden Lady Casino is the latest Rival casino on the market, launched in the beginning of 2014. The casino offers a great variety of Rival games, including the famous i-Slots. We found the design of Golden Lady Casino a bit outdated, but that is of course our personal opinion. Golden Lady Casino offers a whooping casino welcome bonus of 505% first deposit bonus up to $2000 free. The casino offers both download and flash versions, but unfortunately it is not available on Mobile. At this point the casino doesn’t have enough history for us to place a verdict. We have found one complaint from a player regarding Golden Lady Casino withdrawal policy. Until we accumulate more info and the issue is resolved, we would summarize it as “proceed with caution”. There are few advantages in playing in a new online casino, such as higher bonuses, exclusive promotions and possibility to use the low number of players to increase your winning odds. On the other side, the main risk in playing in a new online casino is that there is not enough information on how fair it is? how it treats players? and whether it should be trusted. For the reasons stated above, if you are new to online casino, we would recommended to stick to the know and reliable brands. For experienced players – some of today’s new online casinos will become the most known names in the near future and it is exiting to discover them. Yet, we would advise being more cautious, checking things before making a deposit and moving on to the next if the casino doesn’t live up to your expectations.